I want to share something with you for two reasons. First of all, because I think it's really cool. Secondly, because it has purpose. And, it's purpose is to make us think. 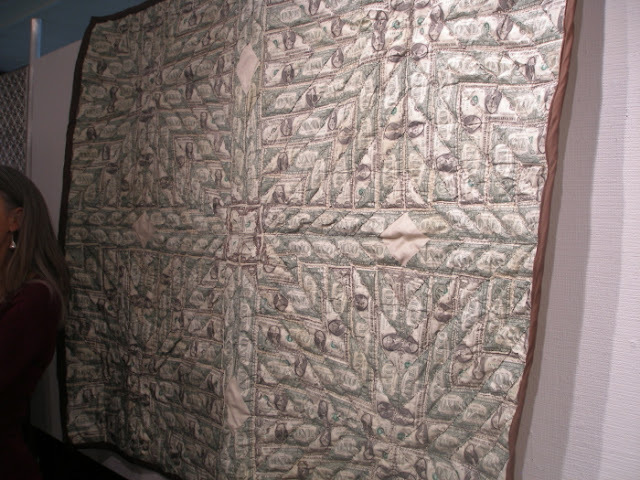 Have you ever seen a quilt made of dollar bills? 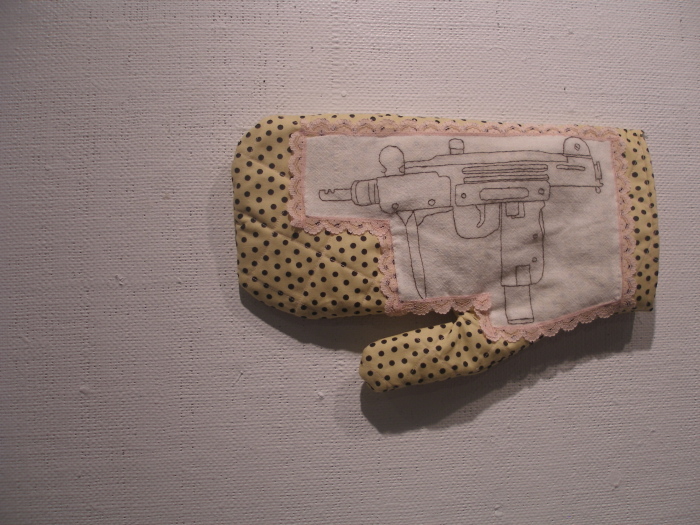 Or an oven mitt with an automatic weapon stitched on it? Well then. It's about time you meet fiber artist Amanda Gross (my lovely cousin) and her Domesticated series. In trying to write a description of her work, I decided that she explains herself and her work most eloquently. It's important that you take time to read this so you understand her pieces. It makes you think, doesn't it? The peace that most of us experience daily in this country compared to that of so many other regions of the world does make us complacent. At least it does me. Can you even imagine if instead of your children rushing to the windows when they hear a low flying plane to get a glimpse of it (as mine do) that you and your children would, instead, hand in hand race from your home or village to seek shelter with your heart pounding in your ears? 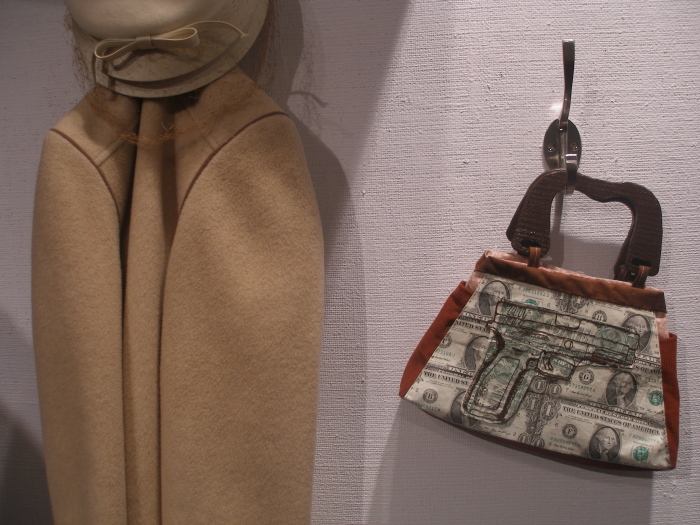 This is what Amanda's pieces make me think about. Women, just like us, who want to do their best for their families and communities are instead living in fear, wondering what the horrors of war might do their loved ones and themselves. Regardless of our stance on whether or not wars are justified, I think that she makes a very good point. 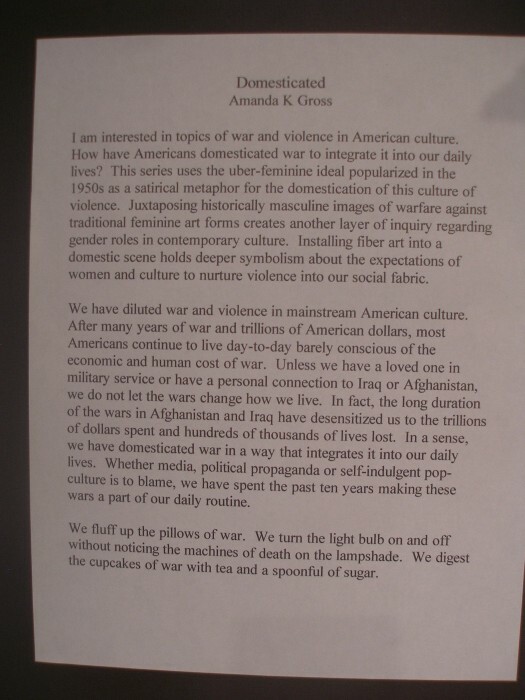 Let's not desensitize ourselves as to how war affects others- the soldiers, the victims, the witnesses, the contributors. 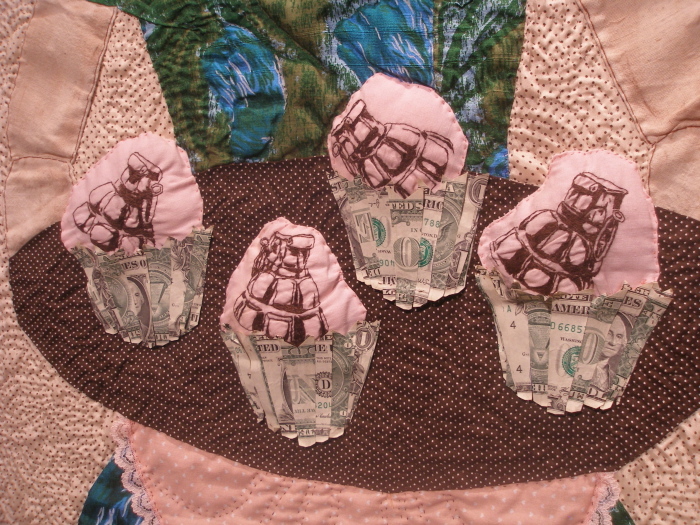 Whether we sew the images on our aprons or not, let's not ignore this. Let's get our knees and pray. Did you know she's my (distant) cousin, too? Perhaps we're related? Wow...what amazing and thoughful work. 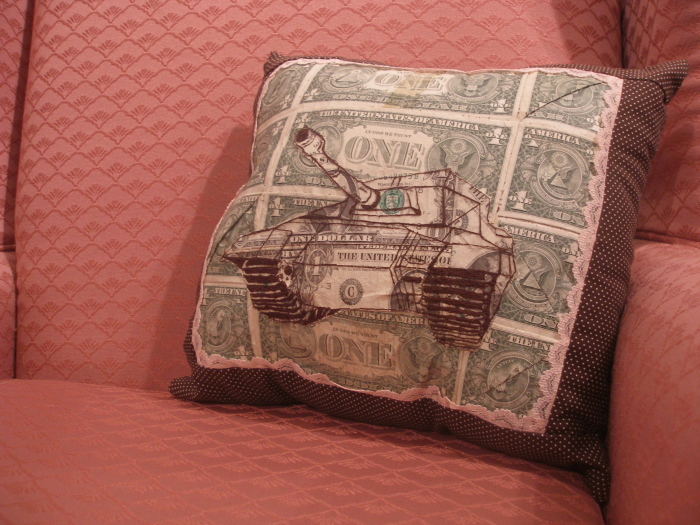 I appreciate the irony of the pillow...money, greed, war, the tank...with frilly lacework. So good... And the cupcakes? Really makes you think...inspiring work for sure. A very interesting post. 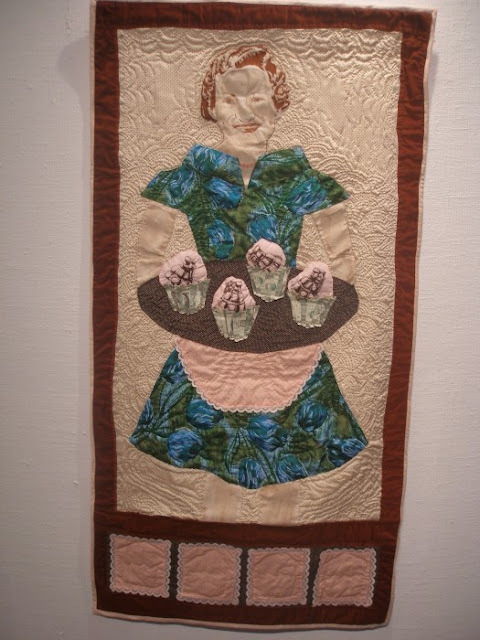 I've been to hundreds of quilt shows and have seen thousands of quilts. But never ones as thought provoking as this. Thanks so much for sharing.